Grandparents fill an irreplaceable role in a child’s development: Pillars of wisdom and sources of support, they possess a unique understanding of a family’s history and traditions. They love their grandchildren with unconditional affection that matches that of a child’s own parents, and though some families are separated by distance or circumstance, being able to connect with a grandchild frequently fosters a relationship that can influence a child to define values, flourish in self-confidence and strengthen the bonds of family. Here is why Grandparents are key to Children’s Development. A lifetime of experiences has shaped a grandparent into who he or she is. A grandparent can quell the urgency of a seemingly disastrous event with the quiet reassurance of perspective, providing a stability that allows a grandchild to navigate hardships with renewed confidence. He or she can also relieve the tensions that a new family might feel under the stresses of young parenthood, granting grandchildren stability in their home. Because grandparents have weathered the ups and downs of life, they make excellent advice-givers and problem-solvers, storing a wealth of practical knowledge. As a member of the family, the love that grandparents feel for their grandchildren is especially strong, amplified by the love they bear for their own children. The relationship is one of blood and history, and grandparents are part of the formation and maintenance of the traditions that define a family. They possess memories that later generations can understand only through stories, and insights into culture and heritage that serve as a legacy for children and grandchildren alike. Relationships with a grandparent can help a grandchild understand the significance of his or her past and put stories to members of the family tree that might otherwise have been only names or yellowed photographs. While it is easy for new parents to feel pressured by the burdens of their responsibility, grandparents can offer a relaxed perspective and remind a family to remain light-hearted. Family game night can be a fun and unifying experience, introducing grandchildren to card or board games that they might not otherwise have learned. Although at first grandchildren may feel overwhelmed by the superior strategies of their grandparents, it can also drive them to master the challenge, developing self-confidence and autonomy. It is highly beneficial for families to set aside time for having fun, and even upon becoming adults many people look back fondly on the childhood memories they have playing games with their grandparents. Though distance may separate some families from frequent in-person interaction, technology allows grandparents to remain a highly connected part of grandchildren’s lives. Social media platforms like Facebook or Twitter allow for the sharing of images, messages, or life events, and programs like Skype or Zoom let families interact face-to-face. Even traditional forms of communication can be a great way to stay in touch: postcards or snail-mail letters are a way to send thoughtful notes and messages on a more leisurely basis. Now more than ever, grandparents can remain an influential part of a grandchild’s life regardless of distance. 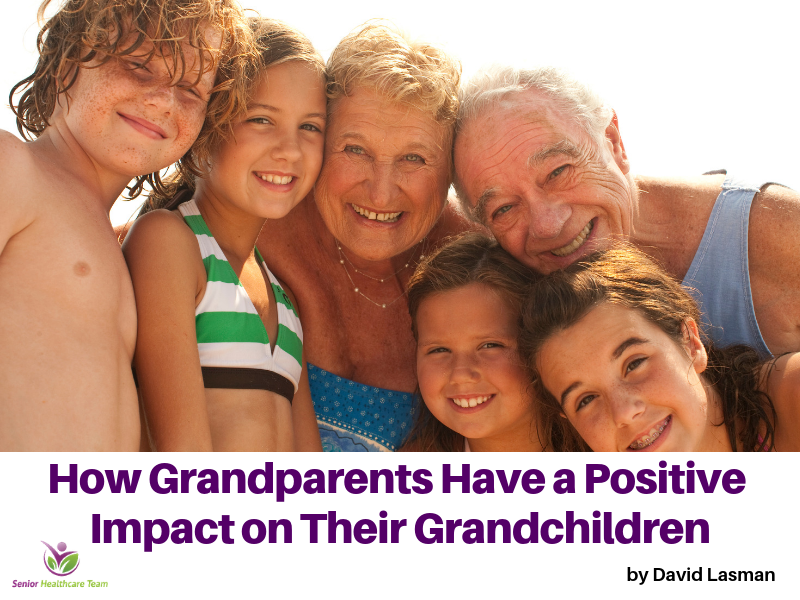 The positive influence that grandparents can have on their grandchildren’s development is profound. By offering love and guidance, imparting wisdom, passing on traditions, and making memories, grandparents can leave behind a legacy that their grandchildren will value for the rest of their lives. Technology gives families the opportunity to remain connected from all over the world, allowing the bonds between family members to stay strong. Selecting the right healthcare plan through Medicare can be overwhelming and downright stressful. Senior Healthcare Team is a nationwide resource that provides guidance and support about Medicare to seniors at no cost to them and helps them to choose the most suitable insurance plan tailored to their specific needs and budget. Our goal is to educate and empower our clients to make the best decisions regarding their healthcare and clear up the confusion of Medicare. At Senior Healthcare Team, we aren’t partial to any one insurance company. Our loyalty is to our clients and our mission is to provide them with the best healthcare options at the very lowest cost.